During a visit to West Middleton Elementary School last week, Lt. 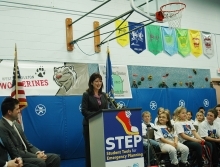 Governor Rebecca Kleefisch encouraged schools across Wisconsin to sign up for the STEP program and help ensure their students are prepared to respond to various emergencies and disasters, from tornadoes to floods to blizzards. STEP (Student Tools for Emergency Planning) is a turn-key classroom curriculum for teachers to prepare 5th graders for various emergencies and disasters. The program also shows students how to put together an emergency kit and develop an emergency plan with their families.